One of the more common issues that we see with people that come into see us is earwax. Earwax or as it is more formally known, cerumen, is a build up from the secretions from the sebaceous glands and the apocrine sweat glands in your ear canal. It is made up of a mixture of shed skin cells, oils and sweat. Believe it or not earwax is not a bad thing; in fact, it is a good thing to have in your ears. It has anti-bacterial properties and works as a protective layer between your ear canal and the outside world. Dust, bacteria, anything that enters the ear canal is met with the earwax and stopped before it reaches the tympanic membrane or eardrum. It also helps to lubricate the skin of the ear canal keeping the correct PH balance. People who do not produce much wax often complain of itchy ears and can be prone to outer ear infections. Normally earwax will make its way to the mouth of the ear canal and simply fall out. The ear canal is, in fact, a self-cleaning organ. Some people produce too much earwax in one or both of their ears, in these cases they will probably have to have regular wax removal. The time between removal can vary radically from Patient to Patient, it depends on the build up. For whatever reason, the natural expulsion of earwax from the canals of these people has been interrupted, sometimes because of the shape of the ear canal. One of the most common reasons for this interruption and the impacted wax that we often find is earbuds. Cotton swabs or as most people call them earbuds are the single biggest cause of impacted earwax. Quite often, what you are actually doing with a cotton swab, is pushing the wax farther into the ear canal. It interrupts the natural cleaning process and the wax begins to build up, eventually, the wax will need to be removed. Earwax removal can be undertaken by trained hearing professionals and other medical professionals. We have now introduced microsuction earwax removal services to our Sutton Practice. We are in fact the first private hearing healthcare centre in Ireland to do so. As part of our commitment to offering cutting-edge care to our Patients, we were committed to offering this service. Microsuction is the safest most comfortable method of earwax removal, no liquids are introduced during the procedure which is undertaken with a microscope and a finely balanced medical suction device. The fact that we can clearly see the ear canal and what we are doing makes it exceptionally safe. with no liquids involved, it is especially comfortable for a Patient and it is usually undertaken in a few minutes. A hearing assessment cannot be performed on anyone with wax in their ears as wax can impact the hearing test results. Impacted wax also obscures the view of the eardrum, which stops us from viewing the health and condition of it. Earwax can also cause difficulties for existing hearing aid users as it may cause their hearing aids to whistle. We noted that more and more of our Patients were having difficulties obtaining earwax removal in the Dublin area. 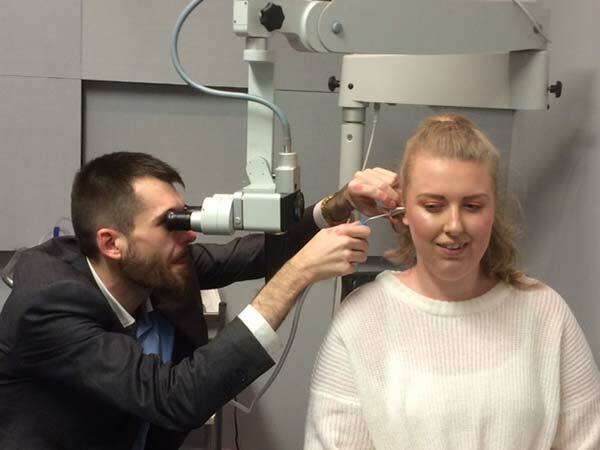 Our earwax removal service is now an integral part of our Practice and anyone can book an appointment. We can also use the irrigation method for people who are more comfortable with it. We use the Propulse NG Ear Irrigation machine, which is commonly used in the medical setting. The irrigation solution is carefully warmed to body temperature, as dizziness can be a common side effect of ear washing or syringing with solutions that are colder or warmer than body temperature. Any other temperature may cause temporary vertigo. We use the irrigation machine to gently stream water into the ear. The procedure is simple, the water flows along the roof of the ear canal. The irrigation solution flows out of the canal along its floor taking wax and debris with it. Irrigation may need to be repeated a couple of times. When the wax has been removed we dry mop the ear to dry out the ear canal. Earwax Irrigation is available at both Raheny and Sutton practices. If the wax is too hard, you may need to use an oil for 1-2 weeks before removal in order to soften the wax and ready it for removal. The age old wives trick of using Olive oil can actually cause issues, any food based oil could go off or ferment in your canal. This may actually cause more issues than you already are facing. It is highly advisable that you get your oil from a hearing healthcare professional or a Doctor. The oil is usually dropped into the ear at night just before bed as it will expand the wax and possibly cause you some hearing difficulties. It is best to do it just before bed and let it work while you sleep.